How could you NOT eat this? These are the colors of my bedroom when I was in junior high school. The colors I wore as a flower child (not that I ever, uh, well, never mind). The colors I first gravitate to when I open a paint box. The colors that completely captivated me at the farmers' market. And, as deeply colorful foods, they are rich in antioxidants; they're superfoods (a health conceit which I'm sure the food scientists will attempt to debunk any minute now). More amazingly, they are rich in flavor. 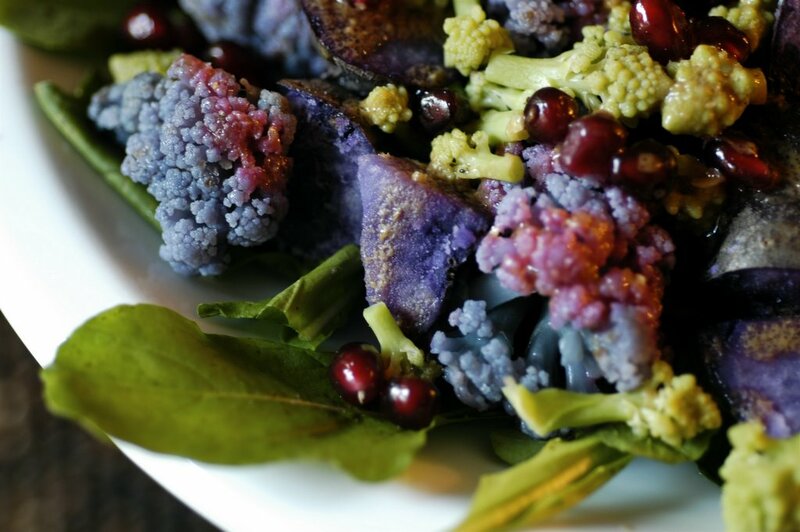 You are looking at a salad of purple cauliflower, purple (Peruvian) potatoes and arugula, topped with flowerets of chartreuse Romanesco cauliflower and a scattering of pomegranate seeds. Unfortunately, for this photo, it is also marred with a dressing made from olive oil, vinegar and miso paste. It tasted great, but the miso sludge on the little purple potato is unlovely to look at, and the acid in the dressing altered the color of the purple cauliflower (see the pink spots?). The secret to preserving the color of the vegetables is to steam them, separately. I cannot be responsible for any color changes once you start playing litmus test. Truly delicious. And a perfect dish for ARF/5-a-Day. If there are any leftovers, we call them "flashbacks." You have a great sense of humor... I think I like the last line the best. Thanks for my laugh of the day! Ummm... Cranky came up with the last line. Full credit to the hubster. Gorgeous salad! I'd be sure to make enough always to have flashbacks!! You're right-I absolutely love the colors. Seeing that really makes me want to paint my entry way a deep purple. The pervuian potatoes are sooo good. What a great idea. tania: I've already bought another purple cauliflower and more purple potatoes! But I have something *else* in mind for them. vanessa: Oh, what a great paint job that would be. Tie-dye veggies, you gotta love it! Great work! Litmus test it may be, but it just makes more colors. I'm going to have to check out the produce market. They sure don't have anything like that at Safeway. Love the salad. Just had some purple cauliflower about a week ago at Fonda. Mmmmm. Meanwhile, can you and yours pop over to my place and tell me what you hate about cookbooks? Or what you love? You see, I'm putting one together for a good cause...Drs. Sans Borders...and I'd love recipes from food bloggers. Wow! What a gorgeous blog. And those veggies! It's art. b'gina: Are you near Santa Rosa? Good farmers' market there, I think. dagny: I'm always so pleased when restaurants bother to get real food instead of what the truck brings. Kalyn: I wonder how that works. Hm. Chemistry!